The inspiration behind Robert came the day of the hackathon as we discussed possible hardware hacks that we could do as a team. As a team we have some experience but it was actually one of our team member's first hackathon, and all of our first Makeathons. We cane up with the idea for Robert as a hope to help make 3D modelling a little more affordable for consumers. Robert's concept was that he would be a small motorized robot who would pivot on a set path determined by fixed wheels. An object placed on a pedestal at the center of the ring Robert makes would then be scanned repeatedly by the Ultrasound sensor located on the shaft coming out of the main base of the robot. This sensor would analyze a ring of distances pinged by the sensor, it would then send this ring of distances to a cloud based database created using Microsofts Azure platform. Then the robot would slightly raise the camera, taking another ring of distances until it covered the entire object. These distances would then be converted to Spherical coordinates in the cloud database where they could then be analyzed by a 3D modeling software that could create a rough approximation of the image using the distances by analyzing where there was no sensor data. Unfortunately this concept was not fully realized due to a malfunction of the Dragon board we were using which resulted in us turning to Arduino late in the hackathon. We built the robot using parts from Home Hardware and pretty much anything else we could get our hands on to create the bot. We fashioned the base out of a sheet of white acrylic, used dowel to create the supports for the robotics and we used a glue tube and a spring to create a makeshift piston to move the camera up and down on top of the bot. These are all rather rudimentary materials but none of the teammates had robotic equipment to work with so we had to make due with the materials in the time limit. The cloud based database was constructed using Microsoft Azure AI, with future plans to link it to the bot so it could transfer the distance data it took to the cloud in real time. 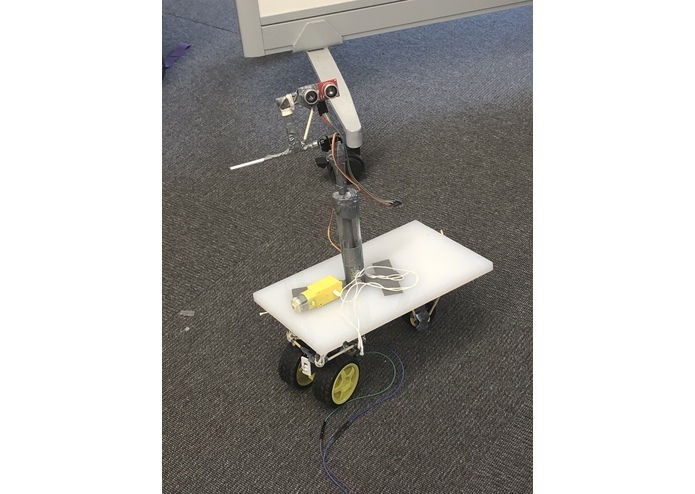 We are proud of being able to create a physical idea to solve a problem and that were were able to bring an idea to life using random objects from a local hardware store that came together to become a robot. We are also proud of the way we worked as a team and how our teammate who was competing in there first hackathon created all the Azure software including a database, a server and other items we planned to use to help make the robot a seamless function from data acquirement to the server. All in all we are proud of our teamwork and effort, even though the robot may n ot have turned out exactly how we wanted him to, we all learned a lot and are excited for a future of hacking! It can only go up from here! 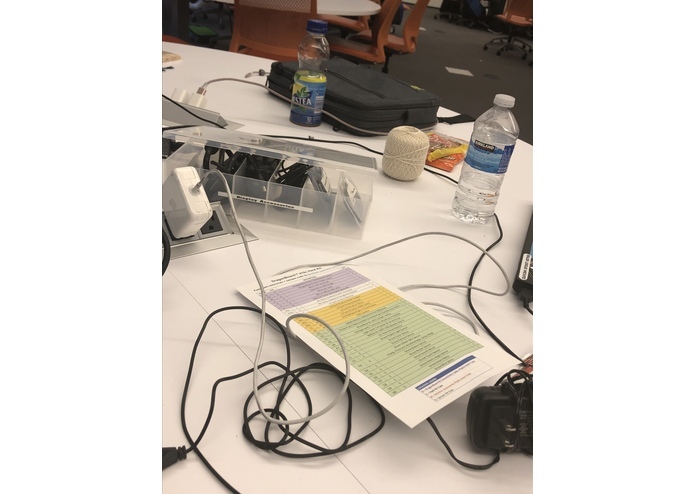 We learned completely how to use Microsoft Azure API, as well as how to improve using Hardware materials that were adapted from their original purpose as well as taking advantage of the mentors help. 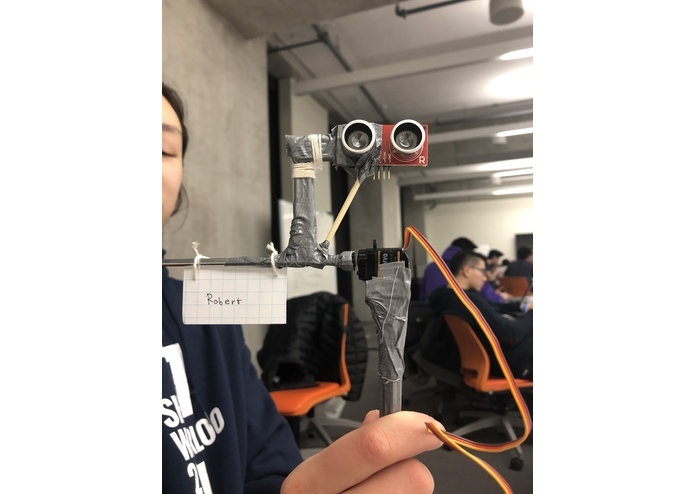 If we had more time with Robert we would use better materials for the construction of the robot, keep the original idea of using the ultrasound sensor to measure distances and render them into 3D models. We'd only need a bit more patience and time. I worked on the hardware and the electronics parts of the project.